5. Is Your Business at Risk of Breaching Anti-Bribery Laws? Rui Fernandes and Kim Stoll have been included in the Who’s Who Legal 2018 in Shipping and Maritime Law. Rui Fernandes and Gordon Hearn have been included in the Chambers Guide 2018 as recommended lawyers in the fields of Shipping Law and Road and Rail Transportation Law. Rui Fernandes, Carole McAfee Wallace and Jaclyne Reive will be doing a “Legal Updates Seminar” to carriers and shippers in the Leamington area on November 3rd, 2017. Canadian Passenger Vessel Association Annual Conference, November 8-10, 2017, Niagara Falls, Ontario. Rui Fernandes will be speaking on “Dealing with Marijuana in the Workplace.” Jaclyne Reive will also be attending representing the firm. Ontario Trucking Association (OTA) Convention & Executive Conference, November 8-9, 2017, Toronto, Ontario. Louis Amato-Gauci and Carole McAfee Wallace will be attending representing the firm. 50th Transportation Law Institute November 10, 2017 in Norfolk, VA. Gordon Hearn, Kim Stoll and Louis Amato-Gauci will be attending representing the firm. Canadian Board of Marine Underwriters Fall Conference, November 28th, 2017, Toronto Ontario. Women’s International Shipping & Trade Association Annual General Meeting Montreal November 30, 2017. Kim Stoll is the Vice President Central Region and will be in attendance. Grunt Club Annual Dinner, December 1st, 2017, Montreal Quebec. Kim Stoll and Rui Fernandes will be attending representing the firm. Toronto Transportation Club Annual Dinner, December 7th, 2017, Toronto Ontario. Mark Newcomb – Counsel and VP Claims & Insurance, Zim Integrated Shipping Services Ltd.
Canada is a federal state with a constitution. Canada has an elected parliamentary system of government. In addition to the federal government it has ten provincial governments, three territorial governments. At the federal level Canadians elect the prime minister and at the provincial levels, the premier. The Constitution Act, 1867 sets out the powers assigned to the federal government and the powers assigned to the provincial and territorial governments. English common law is applied in nine provinces and three territories. French civil law is applied in the province of Quebec. Federal jurisdiction was designed to encompass decisions that affect all Canadians across the vast country – matters of national significance. The federal government has powers that include national defence, foreign affairs, employment insurance, banking, federal taxes, the post office, federal taxes, fisheries, shipping, railways, telephone, pipelines, indigenous lands and rights and criminal law. Provincial and territorial jurisdiction includes direct taxes, hospitals, prisons, education, marriage, property and civil rights. Agriculture and immigration is shared. Certain aspects of provincial powers are delegated to municipal governments, which enact their own bylaws. Legislative jurisdiction is subject to limits provided by the Canadian Charter of Rights and Freedoms, which forms part of the Constitution Act, 1982. Depending on the business, it may be subject to either federal or provincial regulation. For example, an airline may be subject to federal law, such as the federal labour code, for matters dealing with labour and employment but be also subject to provincial laws dealing with real property. The division of powers is further complicated by the “opting” out by provinces from federal programs. For example, Quebec administers its own provincial pension plan. It operates separately from the Canada Pension Plan. In addition, unique arrangements have been developed for Aboriginal peoples in different regions of Canada. Aboriginal groups may have a range of rights and powers over certain lands under the Indian Act and pursuant to historic and treaty rights. The federal and provincial and territorial governments are all responsible for the judicial system in Canada. (*2) Canada’s judiciary is completely independent from other branches of government and all government action is subject to judicial scrutiny. Canadian judges are appointed for life. Canadian judges are fair and well-respected. Only the federal government can appoint and pay judges of the superior, or upper-level, courts in the provinces. Parliament can also establish a general court of appeal and other courts. It has created the Supreme Court of Canada, the Federal Court and the Federal Court of Appeal, as well as the Tax Court. Parliament also has exclusive authority over the procedure in courts that try criminal cases. Federal authority for criminal law and procedure ensures fair and consistent treatment of criminal behaviour across the country. The provinces administer justice in their jurisdictions. This includes organizing and maintaining the civil and criminal provincial courts and civil procedure in those courts. 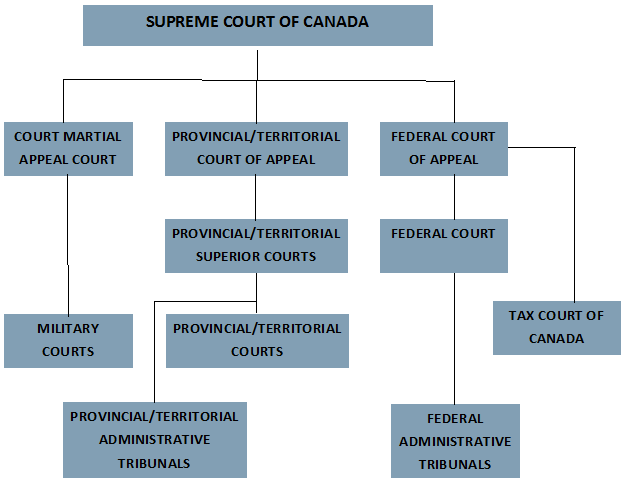 The graphic below is an outline of Canada’s Court System (*3). The Supreme Court of Canada is Canada’s final court of appeal. Its nine judges represent the four major regions of the country. Three of them must be from Quebec to adequately represent the civil law system. The Federal Court specializes in areas such as intellectual property, maritime law, immigration law, federal-provincial disputes and civil cases related to terrorism. The Provincial and Territorial level courts are roughly the same across Canada. Each province has three levels: lower courts, superior courts and appeal courts. Nunavut is the exception. It has a single-level trial court. Administrative boards and tribunals deal with certain types of disputes over the interpretation and application of laws and regulations. Examples are human rights, entitlement to employment insurance or disability benefits and refugee claims. Decisions of administrative tribunals may be reviewed by a court to ensure fairness and proper legal process. Canadian courts may look to foreign judicial decisions for guidance, and both the federal and provincial legislatures frequently adopt foreign legislative models: for example, the Personal Property Security Act in force in Ontario is essentially the same as Article 9 of the U.S. Uniform Commercial Code. Arbitration clauses in agreements are generally enforced by courts and arbitration is extensively used. Canadian courts will generally recognize arbitration decisions, including foreign awards. Canada also hosts a number of mediations with many former judges and senior lawyers available to mediate complex commercial disputes. Canada provides an attractive climate for foreign businesses. It has stable political and economic systems. It has abundant natural and human resources. (*1) This article is part 1 of 17 parts dedicated to a review of doing business in Canada. Subsequent articles will include: Foreign Investment, Business Structures, Securities Regulation, Canadian Immigration, Employment Laws, Directors and Officers, International Trade, Competition, Sale of Goods, Intellectual Property, Privacy, Real Property, Environmental Laws, Taxation, Insolvency, Litigation and ADR. This Part 2 of the article on blockchain (*1), “Blockchain 101”, and deals with the potential for use of blockchain platforms in the logistics and supply chain area. The blockchain protocol for a decentralized digital ledger may work very well in logistics and supply chain management (including insurance). The speed of verification of transactions and the security for transactions involving multiple parties in multiple jurisdictions lends itself to the use of blockchain. Maersk, the Danish shipping giant, recently completed a 20-week blockchain proof of concept trial for marine insurance this year, the company told Fortune. The company partnered with EY, Microsoft, Willis Towers Watson, and several insurance companies to try securely sharing shipping data on a blockchain. Maersk used KSI, a blockchain developed by Guardtime, a startup whose technology underpins the tech-savvy nation Estonia, for the test. The platform was designed to make auditing aspects of a shipping supply chain easier, to improve the tamper-resistance and sharing of data in realtime, and to enable many different parties to settle upon the terms of premiums in a more timely fashion. EY explained that its decision to secure marine insurance data with blockchain was due to a “complete inefficiency” in the sector. “The reason we chose marine (insurance) as the starting point for this sort of market is mainly because of its complete inefficiency,” Shaun Crawford, global insurance leader at EY, told CNBC via phone earlier this week ahead of the announcement. On organization called Kouvala Innovation has an even more audacious vision. Pallets with RFID tags would communicate their need to get from point A to point B by a certain date. Carrier “mining” applications would bid for the right to move that load. The RFID tag would award the business to the carrier that bests meets a shipper’s price and service needs. Then as the move progresses, the blockchain would continue to track the shipment. It is also thought this technology could be effective in enhancing food and drug traceability and for reducing costs associated with factoring. Provenance, a U.K. software startup, looks to use blockchain technology to establish the authenticity of food. Provenance is testing the technology to authenticate tuna caught in Indonesia delivered to Japanese restaurants. Provenance takes information from sensors or RFID tags and records it on the blockchain to track the fish from “hook to fork.” IBM is also interested in food traceability, and has announced a consortium with several major food producers and retailers. The technological talent is scarce and expensive; much of it has been scooped up by fintech startup firms. There are network effects associated with deriving value from blockchain in logistics. The more entities that participate, the more valuable the solution is. But this network effect makes things difficult at the start. It is likely that to get to scale, large companies will need to require their supply chain partners to participate. But this could hinder the drive to create the necessary standards. Further, while several organizations are seeking to play the necessary role of standards body; none has yet achieved the necessary scale. “Miners” are used to validate that the data added to a blockchain is valid. With Bitcoin, this process can take several minutes. There are supply chain processes where less latency would be very desirable. Industries using complex systems such as the aircraft industry may be able to benefit from a blockchain platform. When something goes wrong with a complex “system of systems,” such as an aircraft, it is important to know the provenance or origin, through supply chain management, of each component, down to the manufacturer, production date, batch, and even the manufacturing machine program. Blockchain holds complete provenance details of each component part, accessible by each manufacturer in the production process, the aircraft owners, maintainers, and government regulators. Without doubt, the implementation can be expensive and time intensive. Will the benefits exceed the return value? Part 3 of this article will deal with the legal consequences arising from the implementation of blockchain platforms. (*1) see September 2017 FHLLP newsletter for Part 1. (*8) Gupta, Manav “Blockchain for Dummies – IBM Edition”, 2017 John Wiley & Sons, Inc., page 27. (*9) Ibid, at page 28. Recently, in Platypus Marine, Inc. v. Tatu (Ship), 2017 FCA 184, the Federal Court of Appeal considered a case where one party had orally agreed to pay the other USD$100,000 in interest, in connection with certain debts owing. The issue was whether this amount constituted a criminal interest rate of over 60%. The lower court judge ruled that it did, and substituted a lower amount. On appeal, however, the Court overturned and ordered the debtor to pay the full USD$100,000. On its calculations, and using the dates of each invoice (plus a two-day grace period) as the starting point for calculating the interest (as opposed to the date of the oral agreement), the Court found that a 60% rate of interest would generate an amount of USD$100,529.78 – meaning that the agreed-upon amount of $100,000 was very, very slightly under 60%. The obvious lesson? Be careful what you agree to! The appellant, Platypus Marine Inc. (“Platypus”), is a ship repairer based in Port Angeles in the State of Washington. Platypus provided repairs and maintenance work to the ship “Tatu”, owned by the respondent, Platinum Premier Corporation Limited (“Platinum”). The work took place over several months in 2014; in due course, Platypus sent Platinum ten invoices totaling $285,508.92. Each invoice was marked “INVOICE DUE UPON RECEIPT”, and made no mention of interest. The final invoice was dated September 19, 2014. At that point, Platinum had not paid any of Platypus’s previous invoices. Shortly after sending the last invoice, the parties came to an oral agreement, made at Platinum’s suggestion, where Platinum agreed to pay Platypus USD$100,000 in interest on the amounts owing. In exchange, Platinum would not have to effect payment before the end of January 2015. Platinum then failed to settle the outstanding amounts by the end of January 2015, so Platypus arrested the “Tatu”. On October 29, 2015, Platypus commenced an action in Federal Court against Platinum. Ultimately, Platypus obtained a judgment from the Federal Court in respect of the principal amount owing only. Platinum eventually paid this amount, including costs and interest. What remained was the issue of whether Platinum owed Platypus USD$100,000 in interest, as agreed. Platinum brought a motion for summary judgment on this issue, arguing that the amount constituted a criminal rate of interest, contrary to section 347 of the Criminal Code, which prohibits charging annual interest rates over 60%. The motions judge agreed with Platinum that the agreed-upon interest charge constituted a criminal interest rate. He set aside the oral agreement reached between Platypus and Platinum and ordered Platinum instead to pay Platypus $35,000 in interest. This was the amount that the motions judge concluded that the parties had agreed to, in the event that the USD$100,000 amount was set aside, being the 5% interest rate provided by section 3 of the federal Interest Act. The motions judge applied this rate to the amount of the judgment, rounded to an even figure. On appeal to the Federal Court of Appeal, Platypus argued that the sum of USD$100,000 did not violate the criminal interest provisions of the Criminal Code. Platypus referred to a chart detailing its calculations, wherein its calculation of the interest began three days following the date of each particular invoice (i.e. to allow for a three-day grace period for delivery and receipt of the invoice). Platypus showed that using a 60% interest rate, a three-day grace period resulted in a total interest amount of USD$100,082.21 – thus, on this calculation, the amount charged was (very slightly) under the criminal rate. Platinum argued that the USD$100,000 interest amount was a criminal interest rate. It maintained before the Federal Court of Appeal (as in the lower court) that the appropriate date to begin calculating interest, for the purposes of arriving at the effective rate, was the date of the oral agreement (i.e. September 19, 2014). Therefore, according to Platinum, the interest rate was actually 95%. Platypus disagreed and argued that the correct date for calculation of the interest rate was the date of each invoice, and not on September 19, 2014. Writing for the Court, Justice Nadon held that the determination of the matter turned on the commencement date for calculation of interest. He thus considered Platinum’s argument that the operative date was September 19, 2014. If Platinum was correct in its submission, then there could be no doubt that the USD$100,000 amount did constitute an interest rate well over 60%. On the other hand, Justice Nadon observed that if Platypus was correct in its view, then the interest charged was slightly under 60%. Justice Nadon concluded, first, that the lower court had erred in its finding that the USD$100,000 amount constituted a criminal rate of interest. In the first place, the judge had not made any calculations in his reasons to support this conclusion, but rather rested his finding on the conclusion that both parties’ calculations resulted in criminal rates. Second, Justice Nadon found that the calculations advanced by Platypus (showing that the amount was slightly less than 60%) were correct. Turning to the proper start date for the interest calculation, Justice Nadon had no difficulty in concluding that it was an implicit term of the parties’ agreement that the USD$100,000 was to subsume the interest to which Platypus was already entitled at the time the oral agreement was made. The “interest” referred to in this case would have been pre-judgment interest, which Justice Nadon noted is always payable in admiralty matters, rather than contractual interest. He noted, “the oral agreement must be characterized and understood in the light of the fact that interest was indeed owed by Platinum on the amounts covered by the ten invoices”. Thus, in the Court’s view, interest should therefore be calculated using the date of each invoice. The Court also held that it was reasonable to include a two-day grace period, given that the evidence established that the invoices were not always delivered on the date shown. Ultimately, the Court set out a series of calculations demonstrating that with respect to each invoice, if interest began to accrue on the second day following the date of the invoice, then, at 60% per annum, the total amount owing would be USD$100,529.78. Thus, the USD$100,000 amount as agreed by the parties was slightly lower and therefore not over 60%. The Court noted that even with a three-day grace period, the amount calculated was still (very) slightly over USD$100,000, and thus still not over 60%. Justice Nadon declined to comment on the other issues raised on the appeal, namely whether the lower court judge erred in awarding 5% interest; and whether his calculations in respect of that award were correct. Does your company have an anti-bribery policy in place? Is your company complying with Canadian anti-bribery laws regarding domestic and foreign officials? Is paying for an expedited permit or licence issued by a government official considered bribery for the purposes of Canadian law? Here are the basics that your company needs to know. Is Your Business at Risk of Breaching Anti-Bribery Laws? You or your company are at higher risk of potentially breaching Canadian anti-bribery laws if you are bidding on or are engaged in government contracts in Canada or in foreign countries. Additionally, you are also at higher risk if, in order to operate, you require a permit, licence, or visa that is issued by a public body (for example, this could include safety fitness certificates, CVORs, operating authorities, liquor licences, food and drug licences from Health Canada or a foreign equivalent, import or export certificates or licences, environmental permits, building permits, etc…). The more often you are required to interact with public officials here in Canada or abroad, the more exposed you are to potentially breaching Canada’s anti-bribery laws. Canada has three sets of legislation that govern bribery: The Corruption of Foreign Public Officials Act (“CFPOA”) (*1), the Criminal Code (the “Code”) (*2), and the Extractive Sector Transparency Measure Act (*3). The latter governs payments made by companies involved in mining, oil and gas to foreign and domestic governments and will not be discussed in this article. The description of a Foreign Bribe for the purposes of the CFPOA is quite broad and accordingly, could expand to relatively minor offers as long as some form of benefit or advantage is provided. Additionally, the offence has been committed even if the Foreign Bribe has not actually changed hands, as the legislation covers both giving and agreeing to give a Foreign Bribe. The CFPOA is also broad enough to cover indirect Foreign Bribes where a third party has provided the Foreign Bribe to a foreign official on behalf of a company or individual. Similarly, to the CFPOA, the description of a Bribe is broad enough to expand to relatively minor offers as long as some form of benefit or advantage is provided. An offence has been committed even if the Bribe has not actually changed hands as the legislation covers both giving and agreeing to give a Bribe. The offence under the Code also covers indirect Bribes where a third party has provided the Bribe to an official on behalf of a company or individual. Unlike the CFPOA, there is no exception for Facilitation Payments under the Code. Accordingly, small payments made to low-level officials to expedite routine services are considered Bribes under the Code. The best method of protecting your business from breaching Canada’s anti-bribery laws is by having a robust anti-bribery policy in place that is circulated to employees and contractors, and is monitored and enforced. In order to create or revamp your anti-bribery policy, each company should start with a risk assessment identifying areas where your business interacts with government officials, including through third party intermediaries. Next, with the assistance of counsel, you should set up or revise an existing anti-bribery policy that is targeted to specific risk factors of your business. This policy should be circulated to all employees as well as third party contractors, who should confirm in writing that they have received the policy. Consider implementing training for staff and contractors. Finally, engage counsel to assist with intermittent self-audits to ensure that the policy is being property enforced. (*1) S.C. 1998, c. 34. (*2) R.S.C. 1985, c C-46. (*3) S.C. 2014, c. 39, S. 376. In 2013 in Communications, Energy and Paper Workers Union of Canada, Local 30 v Irving Pulp & Paper, Ltd (“Irving”), the Supreme Court of Canada confirmed a company may conduct random alcohol testing for a safety-sensitive position where the company can establish it operates a dangerous workplace and there is a general problem with alcohol abuse in the workplace. This test is a very high obstacle to overcome. (iii) the employee is returning to work after treatment for substance abuse. This year the Ontario Superior Court gave some insight into the analysis a court may undertake when assessing random testing. See Amalgamated Transit Union, Local 113 v. Toronto Transit Commission, 2017 ONSC 2078 discussed in our April 2017 newsletter. A recent decision of the Court of Appeal of Alberta in Suncor Energy Inc. v. Unifor Local 707A (*1) provides additional guidance on alcohol and drug testing. In 2012, Suncor implemented random drug and alcohol testing for workers in safety-sensitive positions at some of its sites in the Fort McMurray area. Unifor grieved the alleged infringement of unionized workers’ privacy rights. The majority of the arbitration panel ruled in favour of Unifor. The majority of the panel held that the employer had not demonstrated sufficient safety concerns within the bargaining unit to justify random testing. The dissent concluded that there was overwhelming evidence of safety issues within the workplace, including substance abuse issues, and would have upheld the employer’s random testing scheme. Suncorp appealed to Court of Queen’s Bench for judicial review. The arbitration decision was quashed by the reviewing justice, who ordered that the matter be sent back for a fresh hearing by a new panel. The judge found that the majority’s decision to be unreasonable for three main reasons. First, he held that the tribunal’s majority misapplied the balancing exercise outlined in Irving by imposing more stringent requirements than those contemplated by the Supreme Court of Canada. Second, he concluded that the majority erred by only considering the evidence that demonstrated substance abuse problems within the bargaining unit, and ignoring the evidence of substance abuse problems within the broader workplace. [At the site there were both unionized and non-union personnel.] Finally, he concluded that the majority had failed to consider all of the relevant evidence. The Union appealed to the Court of Appeal for Alberta. The Court of Appeal considered only one ground of the appeal: the arbitration panel majority’s suggestion that it should only consider evidence demonstrating a drug or alcohol problem within the bargaining unit. [T]he dangerousness of a workplace — whether described as dangerous, inherently dangerous, or highly safety sensitive — is, while clearly and highly relevant, only the beginning of the inquiry. It has never been found to be an automatic justification for the unilateral imposition of unfettered random testing with disciplinary consequences. What has been additionally required is evidence of enhanced safety risks, such as evidence of a general problem with substance abuse in the workplace. The Court also noted that in an attempt to satisfy this test from Irving, Suncor led extensive evidence about employee substance abuse problems at its Fort McMurray operations. Some of this evidence directly implicated its unionized employees. Suncor introduced evidence about positive drug and alcohol tests that took place after safety incidents or “near misses,” with these records indicating that over 95% of the positive tests had involved unionized employees. However, much of Suncor’s evidence related to the workplace as a whole, and did not distinguish between unionized employees, non-unionized employees, and contractors’ employees. Suncor introduced evidence of over 2,200 “incidents” at its Fort McMurray operations that involved drugs or alcohol, but did not provide a breakdown of how many of these incidents involved unionized employees versus non-unionized employees or contactor employees. The takeaway for employers: employers must be cautious when implementing a random alcohol and drug testing policy. Only a general problem with substance abuse (in a safety sensitive industry) needs to be demonstrated, rather than a “significant problem” (and a reasonable likelihood of risk to heal and safety due to substance abuse) being required in order to justify testing. Rapidly changing technology is impacting the way the world works in every way. Standard operating procedures are amended in response and to take advantage of any benefits. Changes really started when instructions by email became commonplace and then moved to electronic versions of contracts of carriage. The law is always two (or more) steps behind and is only now starting to deal with the effect that such modern practices have on the legal relationships between parties to a contract. As with any “newfangled thing”, litigation will help make clear what must be done next. The use of pin codes is familiar to all of us as a security measure. Pin codes are used by shipping lines as part of their procedures for the release of cargo. Terms have been inserted into certain bills of lading to protect the shipping lines regarding the use of such technology and, until now, those carriers have maintained that the provision of pin codes to effect the release of cargo constitutes effective delivery of that cargo. There are no Canadian cases yet on this issue; however, on May 24, 2017 the Court of Appeal of England and Wales decided the case of Glencore International AG v MSC Mediterranean Shipping Co. SA (*1). The Court dismissed the appeal and held that provision of pin codes by the carrier to the agent of the holder of the fill of lading did not constitute proper delivery of cargo. The carrier was liable to pay for losses resulting from the theft of the cargo. This decision will have significant impact on those utilizing electronic release systems (“ERS”) and pin codes in the shipment and release of cargo. Glencore International AG (“Glencore”) made 69 shipments of drums containing cobalt briquettes (the “cargo”) between January 2011 and June 2012, which shipments were successfully carried by Mediterranean Shipping Company SA (“MSC”). On the 70th shipment, after discharge in Antwerp, Belgium, two of the three containers in the shipment were stolen. Glencore was the holder of the bill of lading and the owner of the cargo. The terms of the bills of lading for the 69 previous shipments were essentially the same as that of the problem 70th shipment. The MSC bills of lading (marked “to order”) allowed one original bill of lading to be tendered to get a delivery order or the actual cargo. Since 2011, the Port of Antwerp operated an ERS, which was not mandatory and was not adopted by all users of the port. Under the ERS, carriers provided, against bills of lading, pin codes, which were communicated by email to the relevant receivers or their agents and the port terminal. The holders of bills of lading would present the issued pin codes at the terminal to then take delivery of the cargo. The pin codes were used in place of traditional paper copies of delivery orders or release notes. In each of the 69 successful shipments, Glencore’s agent at the port had used the MSC issued and emailed pin code to take delivery of the associated cargo. With the problem 70th shipment, Glencore’s agent, after presentation of the bill of lading and payment of freight/charges, had received the MSC-issued pin code via electronic document called a “Release Note”. The agent attempted to arrange for pick up, but two of the three containers had been stolen by unauthorized persons, which thieves had used the same pin code to gain access. Glencore sued MSC for its losses and alleged breach of contract, bailment and conversion on the basis that, as stated in the bill of lading, MSC was required to deliver the cargo against the presentation of a bill of lading not just against the presentation of a pin code. MSC countered that there were clauses in the bill of lading that expressly allowed MSC to use the pin code system. Further, MSC had used that same pin code system successfully in respect of the other 69 shipments and Glencore had been aware of this usage and so had implicitly agreed to its use. The trial judge agreed with Glencore and issued judgment against MSC. MSC argued that its provision of pin codes to Glencore’s agent at the port amounted, in law, to the delivery of possession of the cargo. Just like delivery up of a key to a warehouse where goods are stored, the provision of the pin code (a substitute for the cargo) was, therefore, delivery of the cargo, by a symbolic act. The Court dismissed this argument noting that those presenting a genuine original bill of lading do not receive delivery merely on receipt of the bill or by a symbolic act but by presentation of the actual bill. For “delivery” and the passing of risk to Glencore and its agent, the Court said that it would have been necessary for MSC “to divest itself of all powers to control any physical dealing in the goods.” However, this was not the case, as MSC was still able to revoke or invalidate the pin codes at all times, even if they did not have the contractual right to do so. Delivery was not effected merely by provision of the pin codes. Further, there was no express term in the subject bill of lading that specifically provided that the provision of pin codes would amount to delivery. MSC also argued that an electronic “release note” with pin code was a “delivery order” for the purposes of the bill of lading. Further it was also a “ship’s delivery order” under section 1(4) of the Carriage of Goods by Sea Act 1992, which MSC argued represented an undertaking to deliver to the first person to provide the pin code. Regarding a “delivery order”, this term could have various meanings and was not a defined term. The pin codes were simply used to instruct the terminal to deliver the cargo to anyone who entered the correct pin codes at the port. The Court found that a “delivery order” was to be provided by carriers as an alternative to actual delivery of the cargo in exchange and substitution for the bill of lading. It was, therefore, implicit that the parties intended that a delivery order also included an undertaking by the carrier to deliver the goods to the person identified therein. A pin code did not include such an undertaking and could not be a “delivery order”. Use of the pin code at the terminal, therefore, did not constitute delivery and MSC’s obligations in that regard were not fulfilled. Regarding whether the release note with pin code was a “ship’s delivery order”, the Court disagreed that such section required MSC to deliver to the first person to enter the code, because a delivery order within the bill of lading required an undertaking to deliver to Glencore or its agent, which was not the same as delivering to the first person to enter the pin code. MSC also denied that it was in breach of contract for delivering the cargo upon presentation of a pin code. MSC argued that, for the 69 previous successful shipments, it had used the ERS and provided pin codes by email to Glencore’s agent. Since Glencore gave the “appearance” that it had no issues with this procedure, it could now not argue that the procedure was improper. The Court disagreed, stating that Glencore’s case was not that delivery was made against pin codes but rather that delivery was not made to Glencore or its agent. In fact, Glencore and/or its agents had never advised or somehow agreed that delivery to anyone who had the right pin code/ first presenter (and who was not them) would be acceptable. Successful use and presentation of pin codes had not afforded an opportunity for Glencore to advise on their position had that use and presentation been unsuccessful. Glencore also was also actually not aware of the fact that the ERS was in place and being used in Antwerp. The Court of Appeal dismissed MSC’s appeal and MSC was liable for Glencore’s losses regarding two of three containers in the 70th shipment of cobalt briquettes. MSC has appealed to the Supreme Court. This case is a convincing example that use and implementation of new or evolving technology must also be accompanied by updated legal advice to ensure protection of interests, contractual or otherwise, at all times. Clients using ERS and pin codes in their practices and procedures should look to amending their bills of lading and/or other documentation to accurately reflect whether or not delivery is effected upon use by the first presenter of a pin code. The Court of Appeal for Québec has recently released a split 2-1 decision in the matter of Wärtsilä Canada Inc. v. Transport Desgagnés Inc., which touches directly on the scope of “Canadian maritime law.” (*1) It clarified that provincial laws cannot oust Canadian maritime law in respect of the supply of goods or services to a vessel. The maritime bar can breathe a sigh of relief. The facts of the case were relatively straightforward. Transport Desgagnes, a Canadian shipping company, purchased a new bedplate and reconditioned crankshaft from Wärtsilä, a Dutch manufacturer, for use in its vessel, the MV Camilla Desgagnés (the “Camilla”). Wärtsilä delivered the components to the Camilla in Halifax in February of 2007. Two and a half years later, the new crankshaft suffered a catastrophic failure due to insufficient torqueing of one of the parts. Accordingly, the engine blew up. Transport Desgagnés and its insurers sought damages of more than $5.6 million. The principal factual question for trial was whether the crankshaft was defective when it was delivered or whether the tightening issue resulted from improper maintenance. However, Wärtsilä also relied a six-month limitation period in its warranty and a limitation of liability to €50,000 (approximately $79,000 CDN). Transport Desgagnés argued that the contractual limitation of liability was invalid pursuant to the Québec Civil Code. Thus, the Court had to grapple with the question whether the governing law was Canadian maritime law or Québec civil law; and, depending on the applicable law, whether Wärtsilä was entitled to rely on a limitation of liability. The pertinent factual finding was that the product was the result of a latent defect and not improper maintenance. The trial court then held that the contract was a simple sales agreement and, therefore, was not integrally connected to the federal Parliament’s constitutional jurisdiction over “navigation and shipping”. Thus, it applied the statutory law of the provincial Civil Code, which is within the purview of the Québec legislature pursuant to its constitutional jurisdiction over “civil and property rights”. The Civil Code contains provisions requiring vendors to warrant that goods are free of latent defects. The Civil Code goes further to create a presumption against professional vendors that the defects existed at the time of sale (in other words, it creates a reverse onus, such that a vendor must leave positive evidence in its defence rather than simply putting a plaintiff to the burden of proof). In effect, the Code extinguishes any limitation of liability clause unless the vendor can rebut the presumption. Good faith and ignorance are not defences. Effectively, defendants must show that the buyer or a third party caused the defect, or that the defect only could have been discovered by scientific or technological discoveries made after the sale was completed. Wärtsilä argued the point at trial, but the judge found that the statutory presumptions had not been rebutted. Thus, the Plaintiffs were awarded the full value of their claim. The above-mentioned sale of goods provisions, are in stark contrast to the rules under Canadian maritime law. Under those rules, a latent defect must affect an essential characteristic of the good, making it unfit for its intended use. The onus is on the buyer to prove that the latent defect was known to the seller or that the seller was reckless in disregarding it. In coming to her decision that provincial law applied, the trial judge went so far as to find that there was no practical necessity for a uniform federal regime governing vendors’ obligations. Rather, she found that provincial variances would not adversely affect the uniformity of laws relating to navigation and shipping. Writing the majority opinion for the Court of Appeal, the Honourable Mr. Justice Mainville noted section 2 of the Federal Courts Act (*2), which outlines the bounds of “navigation and shipping”, and he cited Supreme Court of Canada Jurisprudence on point. For example, His Honour cited ITO v. Miida Electronics for the propositions that Canadian maritime law should be uniform across the country and that it should be unfettered in its governance over all matters relating to marine and admiralty matters (*3). His Honour also noted section 22, which outlines presumptive cases that fall within “navigation and shipping”. In particular sections 22(2)(m) and (n), which cover “goods, materials or services … supplied to a ship” and “any claim arising out of a contract relating to the construction, repair or equipping of a ship”. His Honour used harsh judicial language for the trial judge’s reliance on Isen v. Simms (*4), where it was held that the use of a bungee cord to secure a boat on land was not within the scope of Canadian maritime law. He found that the trial judge’s conclusions “not only run counter to the clear language of section 22 of the Federal Courts Act, they are also at odds with general principles of maritime law as well as the unbroken jurisprudence of the Supreme Court of Canada and of the Federal Courts” (*3). His Honour found that it was “self-evident that the repair and supply of engine parts to a ship is intrinsically related to its seaworthiness and therefore directly and integrally connected to navigation and shipping” (*5). His Honour flatly rejected the arguments of the dissenting Honourable Mr. Justice Vézina. First, he rejected any reliance on the Federal Court’s decision in Surplus JT v. Canada, where it had been found that the contract for the sale of a vessel was governed by provincial law. His Honour distinguished that situation from the supply of goods or services to a vessel insofar as the former is not specifically enumerated in section 22 of the Federal Courts Act. His Honour also noted that the Surplus JT case was directly at odds with the Supreme Court of Canada’s decision in Antares Shipping v. The Ship ‘Capricorn” et al., which held that title issues did fall within Canadian maritime law (*6). Finally, the Honourable Mr. Justice Mainville rejected his colleague’s reliance on the fact that the federal Interpretation Act purports to give equal status to the common and civil law with respect to property and civil rights “unless otherwise provided by law” (*7). He found that the application of the Civil Code was indeed otherwise provided by law. Accordingly, the trial judgment was overturned. Damages were awarded based upon the limited value, as there was no valid reason for the Court to invalidate it. In that regard, the Court followed the Supreme Court of Canada’s jurisprudence from Tercon Contractors v. British Columbia, (*8) where it was held that contractual limitations clauses should generally be upheld. 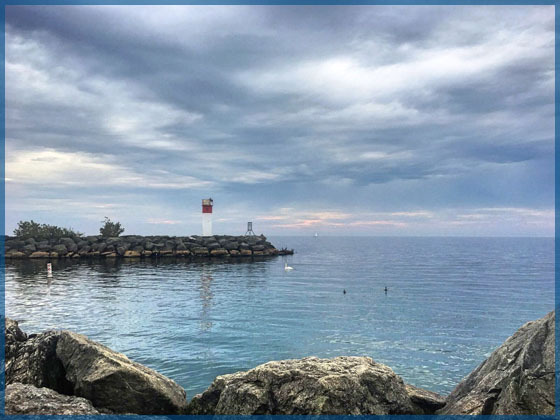 The majority decision is straightforward, if not blunt: Canadian maritime law applies to the supply of goods and services to vessels and it is uniform from coast to coast to coast. The most surprising aspect of this case is that the decision was split and not unanimous. (*1) 2017 QCCA 1471. We previously wrote about the trial decision of the Superior Court, 2015 QCCS 5514, in the December 2015 edition of The Navigator. (*2) R.S.C. 1985, c. F-7. (*3) , 1 S.C.R. 752, cited in ibid. at para. 87. (*4)2006 SCC 41, cited at para. 92 in supra note 1. (*5) Supra note 1 at para. 95 et seq. (*6) 2013 FC 832, cited in ibid at paras. 109-11. (*7) R.S.C. 1985, c. I-21. 9. Safety Plans and Due Diligence for Motor Carriers: WHEN IS ENOUGH, ENOUGH? No good deed ever goes unpunished. Too much of a good thing is, well, too much. The same can be true of due diligence. Due diligence is the level of judgment, care, prudence, determination, and activity that a person would reasonably be expected to do under particular circumstances. In the context of the motor carrier industry, due diligence requires the carrier to take all reasonable precautions and actions, and to demonstrate all reasonable care under the particular circumstances, to operate commercial motor vehicles safely, prevent collisions and highway traffic infractions, ensure compliance with applicable laws and regulations, and minimize the risk of property damage, personal injury and death. Motor carriers are expected – and required under our common law – to do whatever is reasonably practicable and advisable in the given the circumstances to meet these goals. In Ontario, there are no legal requirements under the Highway Traffic Act to develop or maintain a safety program for your business. However, it is considered good practice to develop a program that addresses matters relating to the safe use and operation of commercial vehicles. While the Ontario Ministry recommends the implementation of an effective safety program because it is “good practice”, several other provinces have gone one step further to make it a mandatory legal requirement. This requirement is now so prevalent that any carrier who fails to comply with it before an incident occurs, would have great difficulty convincing Ministry officials, Crown prosecutors, the Licence Appeal Tribunal or a Court that it has met the applicable standard of due diligence in its efforts to prevent that incident from occurring. An effective safety program must be customized to meet all the unique safety-related concerns of a given motor carrier, taking into account the type of equipment being operated and the types of goods being hauled. It should outline the safety practices and expectations for all employees, reinforce the requirement to comply with all applicable laws, and map out the carrier’s policies related to driver selection, orientation, training and refresher courses, ongoing driver evaluation, the manner in which hours-of-service and other compliance issues will be monitored, and the disciplinary program that will apply in the event of non-compliance. Safety programs should be a reference guide and training tool for all employees, they must be refreshed on an ongoing basis to ensure that they continue to be relevant and up to date, and must be rigorously enforced by the carrier. Safety programs can do more harm than good if they are left to gather dust on a shelf, if they refer to outdated regulatory provisions, if the carrier has no evidence that its drivers and other employees have received complete, up-to-date copies of the program and actively refer to it for training purposes, or if they fail to address issues related to new routes or new types of equipment that the carrier operates. Certainly, if a carrier’s safety program maps out a safety-related policy that is not actively enforced, it could be used as further evidence of the carrier’s negligence, for failing to meet a minimum standard that was set by the carrier itself. “operator” means the person directly or indirectly responsible for the operation of a commercial motor vehicle including the conduct of the driver of, and the carriage of goods or passengers, if any, in, the vehicle or combination of vehicles. Every operator is required to hold a safety fitness certificate, which is then used by the Ministry to generate a carrier profile, setting out a record of the operator’s convictions, inspections, collisions, and the results of any facility audits. In very general terms, each carrier is assigned a set of thresholds based on the distance it travels within Ontario, and points are ascribed to each recorded event where the driver or carrier is found to be at fault, or where the carrier’s vehicles are found to be defective. A safety rating of “excellent”, “satisfactory”, “satisfactory-unaudited”, “conditional” or “unsatisfactory” is assigned to the carrier, based on its overall performance as recorded on the carrier profile, and this rating is available for inspection by shippers, insurers and the general public, at no cost. As the carrier accumulates points, if it exceeds 35% of its assigned overall threshold, the Ministry will likely issue a warning letter, and thereafter sanctions of increasing severity, from an interview with company officers, to a “show cause” hearing where the carrier must show cause why its CVOR/safety fitness certificate should not be suspended or cancelled, and plate seizure. When faced with a pending charge under most provisions of the Highway Traffic Act and its regulations, and at each stage along the Ministry’s series of sanctions, carriers are given the opportunity to establish the defence of due diligence. To that end, they will likely be asked to present their safety programs, demonstrate that their programs are up to date and properly tailored to meet the requirements of the carrier’s unique circumstances, while also meeting the minimum requirements mapped out in the Ministry’s published guidelines. Above all, carriers must be able to show that their safety programs are actively enforced, have been made available to all drivers and other employees, and are used as a reference tool and a training manual. As regulatory lawyers, we strongly encourage carrier clients to develop and enforce robust safety programs, and adopt “best practices” in their oversight of carrier safety and compliance matters. This would include periodic review of carrier abstracts, safety meetings and refresher training courses for drivers, mechanics and dispatchers. Historically, carriers have been receptive to the drive for a more hands-on approach to safety and compliance, recognizing that without it, it would be very difficult to present a due diligence defence when the carrier is facing significant penalties, or worse, the loss of its safety fitness certificate. However, we are starting to see some pushback from carriers that rely exclusively, or extensively on independent contractors for the provision of driver services. The concern is that the carrier runs the risk of being perceived as the employer of its independent contractors, if it rigidly enforces its own safety program and policies on the owner-operators. This measure of control is a key element in the common law rules that our courts use to determine whether an individual is a true independent contractor, or an employee. Add to this the fact that many carriers will provide their owner-operators with significant services, such as licensing and insurance, making them look more like employees than was originally intended. So where does this leave the diligent carrier? Does the risk of having a court find that its independent contractors are actually employees that cannot be terminated without cause outweigh the risk of not being able to establish that it has been duly diligent on safety and compliance matters? Given the changing landscape for federally-regulated employers, this would be an excellent time for extra-provincial and cross-border carriers to consult with their employment lawyers and transport regulatory advisors, to ensure that their independent contractor agreements and their safety programs provide a suitable amount of protection against the law of unintended consequences. (*2)Wilson v. Atomic Energy of Canada Ltd., 2016 SCC 29,  1 S.C.R. 770.